The name Giannini is almost unknown outside the circle of car enthusiasts. In Italy the name is mentioned in the same breath as Abarth and Stanguellini. 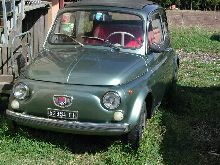 The brothers Attilio and Dominico Giannini started their garage business in Rome in 1920. They were dealers for Italia cars and converted and tuned engines for enthusiasts. A car prepared by them won its class in the first Mille Miglia in 1927.